The 2009 Supreme Court decision in Caperton v. A. T. Massey Coal Co. held that a litigant’s due process rights can be violated when an elected judge refuses recusal in a case in which that judge received significant campaign support from a litigant. The majority emphasized that Caperton was an extreme case, urging states to adopt recusal rules more stringent than the minimum necessary to protect due process. The dissent warned that “the cure was worse than the disease,” predicting a flood of recusal motions would swamp state courts following the decision. 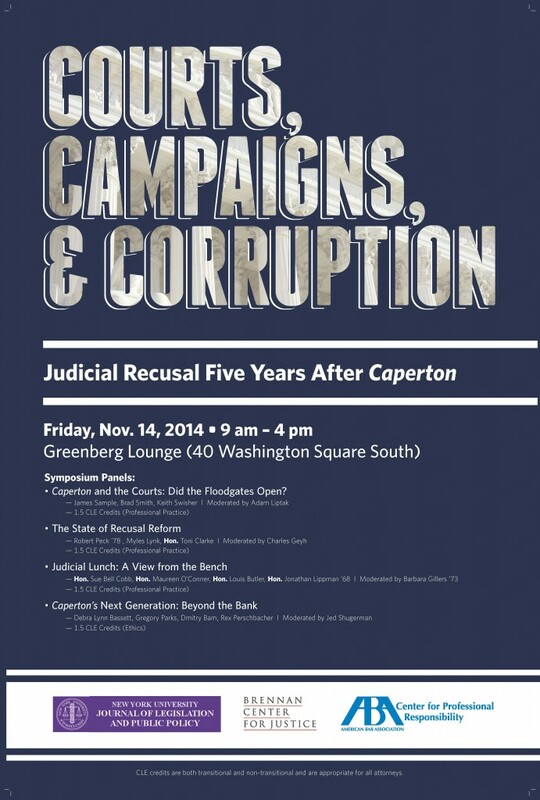 The Symposium looked at the state of affairs five years after Caperton, examined the effects of Caperton in the courtroom, evaluated the state of judicial recusal reform, and discussed the issue of judicial partiality and recusal beyond the context of campaign spending. The Symposium consisted of three panels focusing on different areas of the Caperton decision and issues of bias and recusal and a lunch roundtable during which several judges discussed judicial perspectives on those issues. Panel 1 was moderated by Adam Liptak, Supreme Court correspondent for the New York Times, and included panelists James Sample, an associate professor at Hofstra School of Law, Brad Smith, a law professor at Capital University Law School, and Keith Swisher, an associate professor at Arizona Summit Law School. Panel 2 was moderated by Charles Geyh, reporter to the ABA Commission to Evaluate the Model Code of Judicial Conduct, and included panelists Robert Peck, president of the Center for Constitutional Litigation, Myles Lynk, the incoming chairman of ABA Standing Committee on Ethics and Professional Responsibility, and the Honorable Toni Clarke, Associate Judge for the Seventh Judicial Circuit, Circuit Court for Prince George’s County, Maryland. The Judicial Lunch was moderated by Barbara Gillers, adjunct professor at New York University School of Law, and included panelists the Honorable Jonathan Lippman, Chief Judge of the New York Court of Appeals, the Honorable Sue Bell Cobb, former Chief Justice of the Alabama Supreme Court, the Honorable Maureen O’Connor, Chief Justice of the Ohio Supreme Court, and the Honorable Louis Butler, former Justice of the Wisconsin Supreme Court. Panel 3 was moderated by Jed Shugerman, professor at Fordham University School of Law, and included panelists Debra Lynn Bassett, professor at Southwestern Law School, Gregory Parks, assistant professor at Wake Forest University School of Law, Dmitry Bam, associate professor at University of Maine Law School, and Rex Perschbacher, professor at UC Davis School of Law. Video of the Symposium is available below.